Fall fishing has begun, while summer time holds on. With the first tropical storm Hanna blasting through last weekend, and the first real cold front, entered the beginning of fall. 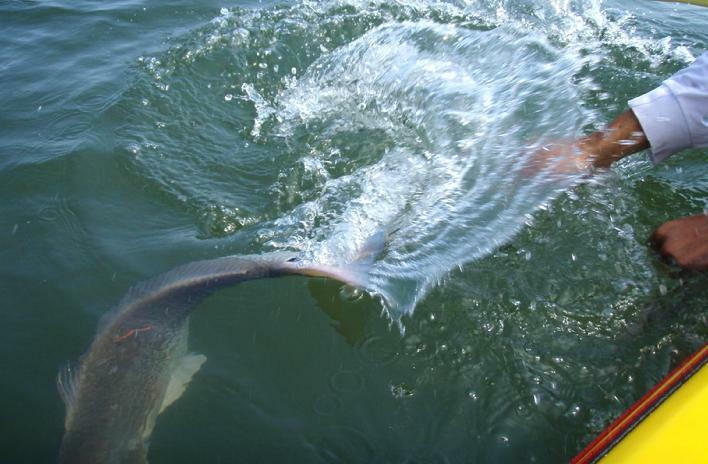 These weather systems trigger the fall movements of all the bay fish. Two years ago I tagged a little red a day before tropical storm Ernesto blew over. 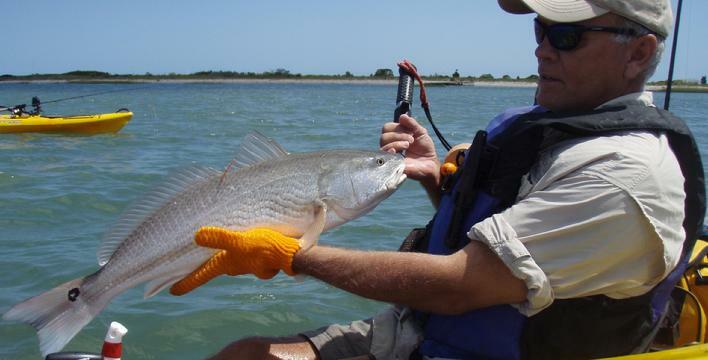 Five days later that red was recaptured at Oregon inlet NC. Lewis Gillingham, director of the tagging program told me this week that a wave of little reds have already moved out and have been recaptured down south. Early in the week, Lee and I hit the back waters for the fall fish. We turned a corner and saw loads of mullet and little tips of tails slowly moving around. Lee had never seen reds tailing, I said, �That�s reds!� and I made a cast into them, and immediately hooking up to a mini red at 14�. We hit them until we scattered the school and moved on. 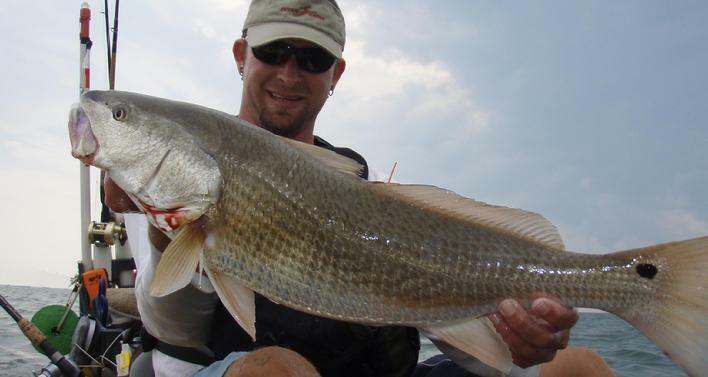 At a good larger red spot, Lee landed a silver drum, aka big croaker. It was 19�, one inch short of release citation but it was too close to 3lb on my scales to not give it a try. I weighed out to 2lb 14oz. Before we headed back, we hit one more spot and ran into a giant school of mini reds, 12 to 16�. We were literally hooking up on every cast, if not as soon as it hit the bottom, then on the second bounce. It was amazing, it was the best and doesn�t get any better than that. I was late for work, Lee said, �If I don�t get one on a cast we�ll leave.� That didn�t work, so I said, �After we fill up this tagging sheet, I gotta go.� That at least gave us an end. I we tagged 40 that morning and I went after work to finish off a full 50. The next morning I went alone, armed with another 50 tags and finished them off in one spot. 100 tags in two days, amazing! Later in the week, we went for the spades. We had no confidence they would be there after all of the wind and changing weather, but on my first drop, I hooked up within 20 seconds to a 13�er. The same schools of spades were still there and in full force, we recapture one every time we go out. We tagged 40. The usual size is 14� with a good one at 16�, then once in 50 fish one gets a hold of your hook that is big, 20�ers, 6 to 7lbers. I hooked a big one first. It ran uncontrollably between the pilings. I lighten up and one arm paddled through, he ran deep in to the open water. I gained a few feet of line and he would rip it off. I had him on for 5 or more minutes then the hook just came out. It was a heart breaking loss. Ten fish later, Lees drag starts screaming, this one stayed hooked and lee landed a 20�, 6lb 10oz big spade. The next day Zach, Lee, his girlfriend Jen and I got into�em again. Lee and I were on one piling he hooked into a big one, I was watching him and my rod bows up hard. Lee�s pulled and I landed an 18� 5lb 4oz�er. If you have the weekly catch on your favorite list, next week will start on a new page for the fall. Click the Weekly Catch up on top next week for the report. Lee's near citation croaker, aka silver drum, 19", 2lb 14oz. My first spanish mackerel, 20" TL. We got out early in the week before the storm and before work. I stepped up in line and rod weight this week after breaking off so many times last week. 30lb line/ leader and rod rated to 1oz. my first fish was a 15"er, the school was still there. Lee, Mike P, and I caught over 20 in the slack tide time. I past the 100 spades tagged mark with 113 as of this week, and we have all recaptured my fish, some just an hour later. There were times when the school came by and we all hooked up at the same time. Lee hooked a good one that was pulling him out to open water. I said, "There is that bigger sized spade, that�s the same fight I had the other day!" but the hook pulled out. Then Mike hooked up and the fish ran on the other side of the piling before he even knew it. See the thing with these fish is they run so deep so fast that you cant see where you line is pointing, once you thumb the spool and one arm back paddle out he�s back in and around the pile. I�ve had one fully figure eight me around the pilings. The only defense is putting the reel in free spool, controlling it with light pressure with your thumb and work your way around. Its very chaotic and a rush! The next morning Damien and I paddled out into the growing NW wind, �At least it will be a good paddle back," I said. The action was slower and rougher than the day before. I landed five from 11" to 15" with two of those tagged from the day before. Damien caught a few then hooked into a heavy mad fish. It started to get around the pilling but it came back around. I said, "Its one of those big ones!" but it looked like a different fight it was lunging toward the end, then we saw it big sheepshead, nearly 26" and 12lbs. Damien�s first sheepshead, a great surprise while spade fishing. Spadefish saved the day. Well, saved the week. Zach came out of hibernation and called this week to get back on'em. So Zach, Lee and I went over to site fish for some little reds. Well, I learn something all the time or confirm what I should have known but had to see for myself anyway. It blew out of the north east for 5 days and of course it muddied up the water. I got there before Lee and Zack and paddled about 3 miles to find some clearer water. When I did I found a small school of black drum in the 20" range and a few reds mixed in. The blacks just don't bite, they just run away. But I did hook one red before the tide started coming in and the visibility dropped. We hunted in shallower as the water rose and got into a little bit clearer water and saw a few but spooked em because we were to close. Zach found one blind casting. We hit the 1st island the next day for sheep and spades. The water temperatures had dropped a bit from the blow and I wasn't sure the spades were going to be there. I paddled up to where I saw them last week and on the first drop, landed a 16"er. That made my day right there. As Zack paddled up I landed a few more up to 15" and Zack landed his first spade. The current picked up and we paddled around the island looking for the black drum but couldn't see any. So I set up for sheepies on the island and Zach jigged for flounder landing a 19"er. When the current slowed we went back to the spade spot and immediately got into 'em. These were a bigger class of spades that I had been use to. I hooked one that pulled me up current as I question weather it was a spade or a sheep, then it tore off line and got into the pilling. I was using a light rod that was no match for the 16" and over size that I think I was hooking. I broke off 8 before it got dark. Next time, i'm stepping up my tackle and horsing them. Wacking some shallow water reds and a winning duck-tape boat. I get a e-mail mid week from two of the Michigan crew, MKF.com, saying they were coming down. I answered, "Y'all are picking a windy week to fish here." They came down for the stripers at the ships a week to late last year, so I wanted to put them on some fish. 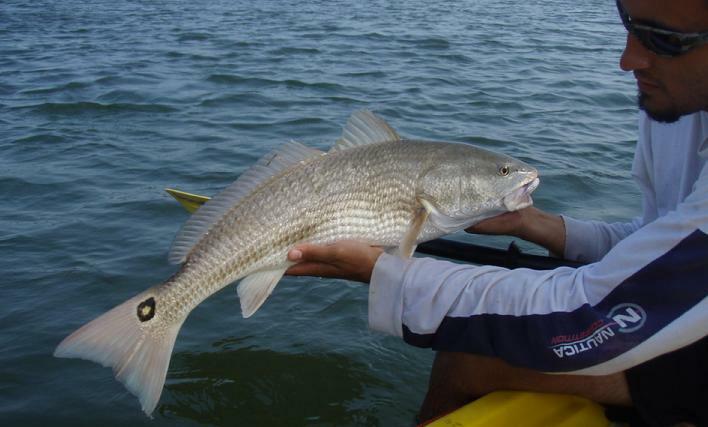 Mike P, and I meet up with Chris LeMessurier and John Fosnaught and paddled out for some red fish sight casting. As soon as I hit the flats a started seeing them. I saw a few larger ones, I'm estimating 35 to 40"ers. At the beginning of the tide, we were seeing small schools and individuals. As the water got higher they pushed up shallower. It got windy but we were able to run into schools of then were we would get doubles, triples, or even everybody hooking up. We patrolled in a line and came across a dark spot in the water. Mike thought it was a sand bar or a cloud shadow, but it was moving. "That's them!" He cast, hooked up, I cast and hooked up. We both yelled to everybody, "CAST, CAST, CAST in to them!!" Jigs go flying in to the fray of scattering reds, and everyone hooks up. A few months ago, I met Derek Hinds, his lumber company, Powmac approached me to paddle for they're team in the duck-tape regatta. They had competed for the last three years and had been beat by another lumber company, Tecnico. It was fun and games at first, but the rivalry had grown serious, so this year, Powmac got a 'ringer', a professional paddler. The event was allot of fun with theme boats and interesting folks. But the competition was tense between the two lumber companies. My biggest threat was from the sleek Tecnico boat, but the paddler didn't have the kayak fishing spinning skill. That was what gave me the edge, total boat control around the buoy. It was a tight competition, he was on me the whole way out. I new from watching him earlier he was going to hit the buoy and make a wide turn. I hit the buoy with Tecnico on my left stern. He was trying to cut inside and push me out. At the turn i stopped and executed a back paddle and cut him out of the turn. I pushed hard and won by only a half of a boat length. One of the coolest thing for me was the builder of the boat was so proud of the trophy. He had wanted that thing for so long, he couldn't stop looking at it. My plan had changed from the paddling to the 1st island. The over night, last minute wind forecast change had me and Damien on the e-shore, trying for nonexistent tog and sheep bite. I wanted some action and wanted to paddle, so I convinced Damien to head out to the high rise for some spades. We had the current and the forecasted wind never materialized I was mad that I didn't go to the 1st island. The current at the high rise was un-fish able, ripping out fast with the full moon. We headed back along the beach and Damien ran over a little red, then another. We both stood up and saw them, Up along the beach in two foot of water. It began. We sight casted to dozens of 26 to 28"ers. We landed and tagged 30 before a mean storm pinned us down on the beach. I had heard that the reds show up with the second peeler peak of the august full moon. We saw hundreds of crab below us. The next day, Lee and I paddled out and saw a few before the wind jumped up to un-fish able. Lee had to go to work, I stayed and paddled around to the lee side and found them big time! Giant schools of the cookie cutter 27" size. But there were a few larger 'yearling' size, landing a 30" and a 34" red. I saw little black drum and even a skinny striper that looked about 38". The action was intense for the rest of the afternoon, landing 28 myself. There were times after releasing one,I would stand up to find them and I was right over top of them. They were so aggressive they were following the hooked one trying to grab the bait from its mouth. Nearly 60 reds and never a blind cast. That is a good as it gets! 4" Gulp shrimp on a 1oz jig. Between the winds we went after the rock fish. Not stripers, but the rock dwelling fish, sheepshead, toutog and triggerfish. It was slow going but we managed to find a few each day. We even found a few small spadefish, blind dropping clams in the murky water. Once we found a sheep bite, they were small. Baby's compared to the ones we can catch. A positive thing about the small sheeps is that it might be showing a growing population. Lewis Gillingham said, " We haven't had allot of small ones caught around here." We don't know if nobody has tried to target them or if they are new to the seane. Whatever the case is they are fun to fight, with scaled down tackle. The colorful triggers were a nice bonus to the rock targets. Damien was the only one to land a tog, a 13"er. That is one fish that has not had a good showing this summer in comparison to last. I caught a near citation tog a few summers back. Damien's super amazing kayak cast netting skills. We hit the first island hard this week, two morning before work and and a 13 hour all day-er on Fri. On Monday Mike P and I targeted spadefish and black drum. Tuesday, Lee and I targeted spades and sheeps. And on Friday, spades, sheep and black drum with Damien. Monday the drum were low but the spades were out to play. Mike and I didn't catch allot of spades, but a larger class of fish had definitely moved in. Last week the range was 10 top 14 inches, this week a school of 12 to 16 inchers were there. My biggest on Monday was a 16"er. 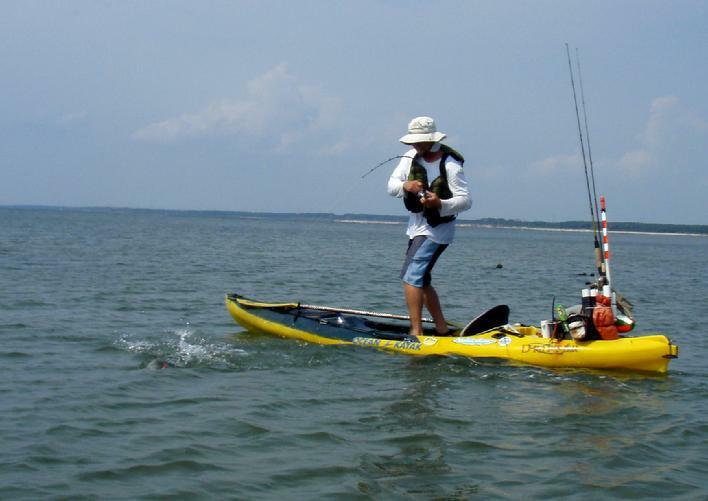 when I got home I got to thinking, " I don't remember seeing a kayak record for spadefish." I checked out the kayakfishingrecords.com site and there was none. On Tuesday I took my Rapala digital hand scales hoping I would land another 16"er. In VA, a trophy spade is 22" or 9lb killed. A 16"er is a medium sized spade, but its the biggest I had caught and there was no category for it in the records. Friday Damien and I head out for an all day-er. Three targets in our sights. Spades during slack tide, sheeps during the current and the drum for the frustration. The drum where there, they were just low and covered up by a hundred 25 to 30 inchers. Damien hooked up to a big one, breaks his rod tip and pulls the hook after a heavy fight. We went back to the sheeps with no bites then to the spades. The water only had about four foot of visibility, not enough to see the spades but I managed to find four from 12 to 15". Back to the sheeps late in the day. The action was minimal until I set the hook into the trade mark sheep wobble. "This is it!" I yell to Damien. Then it ran hard ripping drag and I was stuck in the eddy of the piling. I got any from the certain break off and got the fish up. "Oh, hes a big one!" I got'em in and it measured 27" and 13lb 10oz. Then I realized I just beat Lee's record 12lb 1oz sheep from last year. " Bout time I beat one of Lee's records!" Also Oceans East has the new and improved kayak wreck anchors, with stainless rods. Your going to need them this coming month if you are thinking about hitting sheepshead or tog in the fall. There are fish all around, from kings and cobia off sandbridge, to little reds in the inlets, the weather is finally leveling out, get out and enjoy it, get out and GET ON'EM, kev. Two great days at the First, and one, not so much. I spent half the week with fellow Ocean Kayak VA Pro John 'Toast' Oast working the Johnson Outdoors Dealer Conference at Stone Mt GA. What a beautiful place it was. We had a chance to paddle some of the brand new boats. The Trident 11 and 13 both were top of the line and high teck. Tthe high light was meeting all of the kayak shop owners and the Ocean Kayak pro staffers. Jeff Herman from Texas, Chrystal Murray, Greg Bowdish, and Jason LeValley from FLA. and Randy Vining, Tony Narcisse, and Sam Patrick from GA made the time very enjoyable. Toast and I made some good fishing friends from around the south east. I mentioned in the heading, I hit the first island hard this week with two days being fantastic. 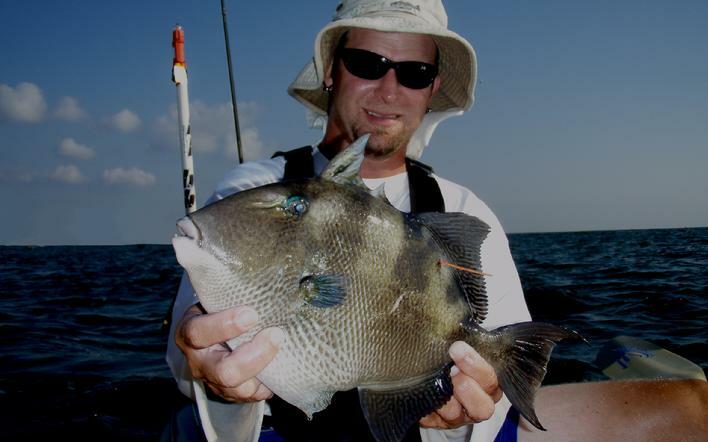 Black drum were up and castable and the spadefish were biting around the pilings, for the first two days. For some reason the spades didn't bite on Saturday and the blacks stayed down out of casting depth. Damien and I got skunked. Then the wind that was forcasted for south at 5 to 10 mph turned in to a east 15 mph blow, it took us 2 and a half hours to get back, piling by piling. A few of the awsome Ocean Kayak pro staff, from left to right, me, Carson Searey (NC), Jason La Valley (FLA), Greg Bowdish (FLA), "Toast", Jeff Herman (TEX). My first time kayaking in land locked water. Stone Mt GA, on the new Trident 11. Out to the 1st island, wackin some spades. I finally got out to the first this week with Lee, Mike P, and Damien with sheepshead as the target. We were set up for the slack tide when a school of spadefish circled us. We always see spades this time of year and we have never been able to get them to bite. So when Mike asked me for a clam, Lee and I both laughed, " They're not going to bite, your wasting valuable slack tide minutes." Then he hooks up. Lee and I scrambled to get a rig together. I brought about a half dozen clams left over from black drum fishing to use if i got into some trigerfish, so I wouldn't waist any fiddlers. I dived the clams up. I rigged up a 1/2oz jig head for a weight and Lee gave me a small hook. After a while I was just getting hits on the jig head with clam. Mike and I landed at least a dozen each, Lee was wearing them out and at minimum, landed 20. They were small from 10" to 14" but fought unbelievably hard for there size. They were a super fun distraction to the target fish of the day. Lee and Mike paddled in, Damien and I went for the sheeps with the dozens of unused fiddlers and didn't get a bite. So we looked for another distraction, black drum. They are there, just real sketchy, and no hook ups. Earlier in the week, Mike invited me to his back yard fishery where the night before, he got on as many reds as he could cast to. We landed a dozen 21" to 26" reds, sight casting to exploding bait fish and boils. It was allot of fun with a couple double hook ups. My first sheepie and a mini-tour with Shante. Small opportunities opened up for us this week to get on some rocks. It was Damien's first time tog/sheep or rock dropping style fishing. The bite was slow where I was fishing and Damien was shallow. He started loosing bait, Lee and I said," Yea that's probably sea bass." Not in the hole Damien was dropping, he finally hooks into a nice medium size tog. After watching him fight another one I asked if I could join him. I dropped a piece of clam and instantly hook a fairly large triggerfish. We continued to work the tog till we were out of fiddlers. The next day after the rain and before the wind, I caught some mole crabs and finally caught my first sheepshead of the year. It wasn't the big boys, but I was targeting them with my light gear and it was a blast. Trying to get on something. Its first island time. But between work ( yes, I have a full time job) and the wind, I haven't gotten the chance to get out there. We hit closer range targets this week and did ok. We jigged a flounder reef this week and Lee lost a descent flounder at the boat. We paddled to a rock pile trying for small spades and Lee lands a hard fighting sheep and a tog, with a bobber rig! Friday, Lee went down to Oregon inlet for some off shore charter boat action and landed a 30lb sailfish and his girlfriend, a 60lb white marlin. I went to the E-shore to get away from the 4th of July crowds for some flounder. I wasn't looking for allot of small ones to tag, I was using a 2oz jighead and a GULP 6" grub that we call the 'jigasarus'. I was hunting for a bubba flounder. I landed two 19"er and lost one that was way heaver, but never saw him. I did see a baby bird, who was learning how to fly smack into the ships and land in the water. He was trying to grab on to the barnacles to get out of the water. I paddled over a grabbed him out of the water, placed him behind me and kept fishing. He dried off and tried to take off, and again, into the wall. I got him out for a second time. He dried off and I put him on the ship this time. The little wet baby bird drying off. Ric talked me into going over to the shore to see if the reds were still around. On our way out we got sidetracked by dozens of big, big sharks fining in one to two feet of water. While I was on tour, Ric saw a few. On Thursday, there were dozens. All we had was peelers and we casted them right in front of the cruising 6 to 8 foot sharks, and yes, it was intimidating. They would turn to and move over the crabs, circle and move on, or swim right to us before thrashing away with a huge wake when they figured out what we were. i was soaked and my heart was pumping! We never could get one to bite, we decided we would be back with oily fish bait the next day. Ric, Lee, Mike b, Matt and I came armed for a hook up. We had fresh off the boat menhaden, bluefish and spanish mackerel. again they just were not hungry. Lee had three circle his bait, head right for him and took off with a huge splash. The water was deeper and they were sneaking up from behind and checking us out. Not being able to see them was a touch scary. We would just see the large mud boil under us or the sudden crash in the water from behind from the spooky beast. I asked around and it seems that these sharks are giving birth. There predatory nature is suppressed so it the pups wont get eaten. In hindsight,it was good for us also. They were big sharks. Maybe in a few weeks they will be done 'pupping' and get hungry. Lee, Mike p and I hit Rudee and whacked the small flounder. Between us we caught 50 or so, with absolutely no keepers. Lee and Mike caught a few small specks. On Saturday I tried for the spanish mackerel at Cape Henry. I caught nothing but blues, tiny blues. Ill try again this week.